Crane removal is used when the tree must be lifted over a house or other large structure or is too large to remove from its location. Tree removal with a crane is common in Atlanta. Metro-Atlanta’s large Oak, Poplar, and Pine trees often times grow very close to homes, businesses, and roads. Urban trees are not always able to be removed with a felling technique or traditional tree removal. Proximity to structures, roads, and landscaping make roping a tree down or allowing it to fall impossible in some situations. 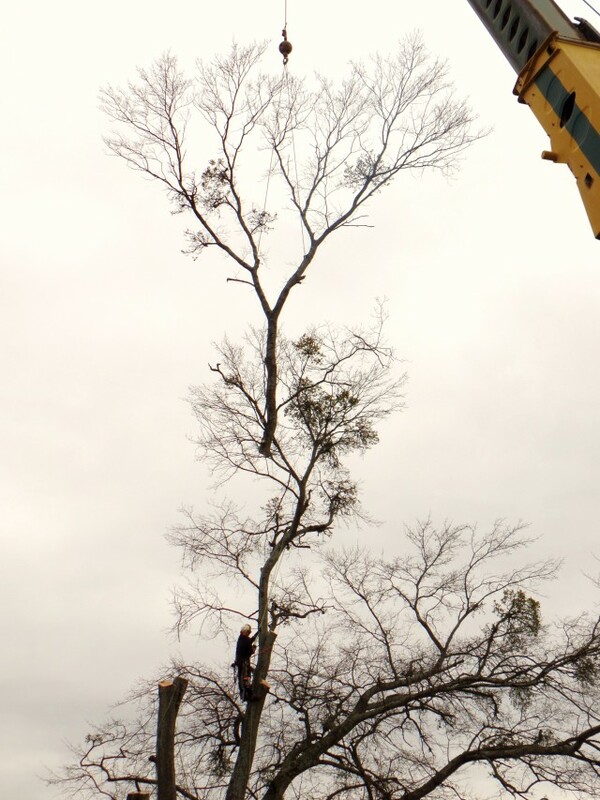 To begin the tree removal process a Certified Arborist will either use a crane from his fleet or hire a crane company that has the proper size crane to remove the tree. The crane operator will park as close to the tree as possible, asses the best way to lift the tree and the closest location to set the tree down so the ground crew can begin the cleanup process. Once the crane, workers, and other trucks and equipment are in place a climber will ascend the tree using climbing spurs and rope. When the climber is in place, he will start attaching branches or sections of the tree to be lifted by a steel choker cable or nylon strap that is rated to lift thousands of pounds. The crane operator will place the large branches (or sections) on the ground and the ground crew will then begin to cut the branches and chip them into mulch. When the crown of the tree is removed, the climber must then work his way back down the trunk of the tree, removing portions as he goes. The climber remains tied safely to the trunk of the tree while he descends. The climber and the crane operator must work as a team each time a cut is made. Using hand signals or radio controlled headsets the climber and crane operator communicate to get the tree cabled in the right spot to be lifted up and away. The climber must also know the weight of the wood to be lifted and the crane operator must communicate to the climber his maximum lifting capacity at that range, this information determines where the climber must make his cut. Often, this method can be the safest and most cost effective method of tree removal. If you are considering tree removal this year, make sure you consult with a Certified Arborist. A Certified Arborist has the training necessary to determine if your tree is dead, declining, hazardous, or not in need of removal at all. Only an arborist can evaluate the safest and most cost effective way to remove your tree and reduce the risk involved with tree removal.